This modern beachfront compound on Long Island is on the market for $21 million. It's located about 100 miles from New York City in Montauk, New York, the summer playground to some of America's wealthiest, including A-list celebrities like Robert DeNiro and Ralph Lauren. "It's a uniquely modern style, where the main house sits flat against the ground, while the guest house is raised about 19 or 20 feet above the ground," which makes it look as if it's floating, Corcoran Group broker Gary DePersia tells CNBC. The estate sits on 4 acres with 300 feet of ocean frontage and private beach access. The 5,500-square-foot main residence is designed with steel and stone and has floor-to-ceiling glass windows. The cutting edge design is also built to withstand hurricane-force winds. "The intent of the architect was to bring the views of the ocean right into the living room," says DePersia. Glass doors slide open to reveal the mid-century kitchen. One level below the kitchen is the futuristic movie theater that glows psychedelic orange. "To me, the theater is 'The Jetsons' meets Steven Spielberg," says DePersia. "Every chair is a bed. You're never going to want to watch a movie anywhere else." Steps away from the main residence is the 2,400-square-foot "floating" guesthouse, which is suspended on steel beams and has beach ball-colored walls. 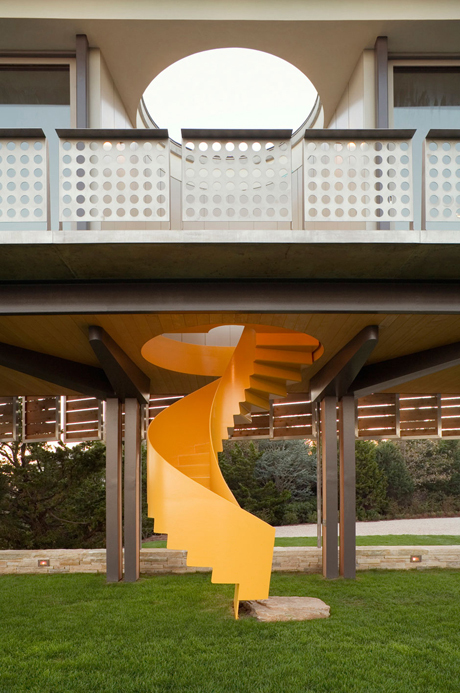 A spiral staircase painted in yellow leads upstairs to the living quarters. The two-bedroom guesthouse has a living room, an office, a kitchen and a wraparound balcony with views of the Atlantic. "The architect designed this very cool, modern guest house to be a throwback to a 1950s motel," says DePersia. The estate, located on Old Montauk Highway, is currently owned by real estate investor Michael Hirtenstein, who bought the property in 2013 for $13 million, according to public records. Christopher DiLella is a segment producer for CNBC's specials unit, covering luxury lifestyle and real estate. He works on the prime time TV show "Secret Lives of the Super Rich."